For fans of filmmaker Wes Anderson, the arrival of a new movie by the quirky auteur triggers an excitement akin to that of a ten-year-old boy opening a highly-coveted new toy at Christmas. For them, something about the director’s style conjures a nostalgic glee; the puzzle-box intricacy with which he builds his cinematic vision combines with the detached whimsy of his characters to create an experience not unlike perusing a cabinet of curiosities, bringing out the viewer’s inner child and leaving them feeling something they’re not quite sure of for reasons they can’t quite put their finger on. Those who love his work – and there are a lot of people in this category – find it immensely satisfying. Those who don’t are left scratching their heads and wondering what the point was to all that tiresome juvenilia. Anderson’s latest, “Isle of Dogs,” is likely to meet just such a split in opinion – and this time, thanks to accusations of cultural appropriation, marginalization, and outright racism, it’s not just about whether you like the directorial style. His second venture into the field of stop-motion animation (the first was “Fantastic Mr. Fox” in 2009), it’s an ambitious fable set in a fictional Japanese metropolis named Megasaki, twenty years into the future. The authoritarian mayor, the latest in a long dynasty of cat-loving rulers, has issued an executive decree that all the city’s dogs must be exiled to “Trash Island” – including Spots, the beloved pet and protector of his twelve-year-old ward, Atari. The boy steals a small plane and flies to the island, where he enlists the aid of a pack of other dogs to help him rescue Spots from the literal wasteland to which he has been banished. Meanwhile, on the mainland, a group of young students works hard to expose the corrupt mayor and the conspiracy he has led to turn the citizens against their own dogs. In usual fashion, Anderson has made a film which expresses his unique aesthetic, marked with all his signature touches: his meticulously-chosen color palette, the rigorous symmetry of his framing, the obsessive detail of his visual design, and the almost cavalier irony of his tone. These now-familiar stylistic trappings give his movies the feel of a “junior-adventurer” story, belying the reality that the underlying tales he tells are quite grim. The cartoonish quirks of his characters often mask the fact that they are lonely or emotionally stunted – and the colorful, well-ordered world they inhabit is full of longing, hardship, oppression, and despair. “Isle of Dogs,” though ostensibly a children’s movie, is no different. Indeed, it is possibly the director’s darkest work so far, and it is certainly his most political. Though it would be misleading to attribute a partisan agenda to this film, it’s not hard to see the allegorical leanings in its premise of a corrupt government demonizing dogs to incite hysteria and support its rise to power, nor the social commentary in the way it portrays bigotry based on the trivial surface characteristic of preferring dogs to cats. Make no mistake, despite its cute and fluffy surface and its future-Japanese setting, “Isle of Dogs” can easily be read as a depiction of a world possessed by the specter of Nationalism, and a clear statement about life – and resistance – in Trump’s America. In terms of visual artistry, Anderson has outdone himself with his latest work. The painstaking perfection of the animation is matched by the overwhelming completeness of the world he and his design artists have executed around it. Myriad elements from Japanese culture are used to build the immersive reality of Megasaki (and Trash Island, of course), and the director adds to his own distinctive style by taking cues from countless cinematic influences – Western and Eastern alike. Of course, the film’s setting and story invite comparisons to the great Japanese filmmaker Akira Kurosawa – whose iconic Samurai movies were an acknowledged influence. Anderson mirrors the mythic, larger-than-life quality of those classics; he uses broad strokes, with characters who seem like archetypes and a presentation that feels like ritual. These choices may have served the director’s artistic purpose well – but they have also opened him up to what has surely been unexpected criticism. Many commentators have observed that, by setting “Isle of Dogs” in Japan (when he himself has admitted it could have taken place anywhere), Anderson is guilty of wholesale cultural appropriation, co-opting centuries of Japanese tradition and artistry to use essentially as background decoration for his movie. In addition, he has been criticized for his tone-deaf depiction of Japanese characters; his choice to have their dialogue spoken in (mostly) untranslated Japanese serves, it has been said, to de-humanize and marginalize them and shift all audience empathy to the English-speaking, decidedly Anglo actors who portray the dogs. There has also been objection to his inclusion of a female foreign exchange student as the leader of the resistance, which can be seen as a perpetuation of the the “white savior” myth. Such points may be valid, particularly in a time when cultural sensitivity and positive representation are priorities within our social environment. It’s not the first time Anderson has been criticized for seeming to work from within a very white, entitled bubble, after all. Even so, watching “Isle of Dogs,” it’s difficult to ignore the fact that it’s a movie about inclusion, not marginalization. It invites us to abandon ancient prejudices, speak up against institutionalized bigotry, and remake the world as a place where there is room for us all. It’s a message that seems to speak to the progressive heart of diversity. Whether or not the delivery of that message comes in an appropriate form is a matter for individual viewers to decide for themselves. For Anderson fans, it will probably be a moot point. Rudyard Kipling was a product of his era. An Englishman born in Colonial India, he grew into a prolific author and poet whose canon was informed by his childhood experiences there. Though his literary gifts were undeniable, and much of his work is still widely read more than a century later, he has come to be seen as a champion of British Imperialism. The world view of white-privileged conquerors, with their assumption of racial superiority over the indigenous populations they subjugated, is deeply embedded in the fabric of all his stories- including the much-beloved children’s tales for which he is most remembered today. Needless to say, in a modern world keenly aware of the issues surrounding race, this makes him a controversial figure. He is regarded by many as an unapologetic racist whose writing, even at its finest, was little more than propaganda for the cause of white supremacy. Others vehemently insist that he was a humanist working from within the system to illuminate both the noble and ignoble traits of all people and thus promote a more egalitarian mindset. Arguments and evidence are plentiful in support of either side, as well as of the myriad viewpoints which lie somewhere between those two poles. Of course, the majority of modern moviegoers are unaware of this literary debate, which is undoubtedly why two major studios have both developed family-friendly blockbusters based on the most well-known of Kipling’s stories: “The Jungle Book.” The first of these, directed by Jon Favreau from a screenplay by Justin Marks, is the Disney studio’s latest effort to remount one of their animated classics as a live-action film for the 21st Century generation. Their previous version- the final film personally overseen by Walt Disney himself- was released in 1967, and though it has become a cherished favorite to those who grew up with it, at the time it was heavily criticized for taking Kipling’s rather solemn original and turning it into a rollicking, jazz-infused comedic showcase for a star-studded cast of voice talent. This time around, Marks and Favreau have doubled down on that same approach, while also expanding the basic story framework to include elements from the Kipling tale (or rather, tales- what we have come to know as “The Jungle Book” is actually derived from several short stories concerning the man-cub, Mowgli, and his adventures in the jungle with his animal mentors). The result feels like a satisfactory blend, a best-of-both-worlds crowd-pleaser which captures the serious tone and allegorical flavor of Kipling while still delivering the good-natured hi-jinks expected from a studio known for its fun-for-all-ages romps. It’s also a technical masterpiece. The use of CGI and performance-capture technology has yielded a breathtaking visual experience, giving us a lush and majestic experience of the Indian wilderness as well as remarkably believable depictions of the animals which comprise most of the cast of characters. This latter element also benefits from superb vocal portrayals by the likes of Ben Kingsley, Scarlett Johansson, Idris Elba, Christopher Walken, Lupita Nyong’o, and the always-welcome Bill Murray. Perhaps most importantly, newcomer Neel Sethi gives an on-point performance as Mowgli, a remarkable accomplishment for a young actor whose work took place on a soundstage far removed from the world on display in the finished product. Yet for all its excellence, this new “Jungle Book” feels somehow overdone. There’s a “bigger-is-better” philosophy at play which detracts from its meticulously-constructed authenticity; a larger-than-life quality may be appropriate to the material, but is it really necessary, for instance, for King Louie to be the size of King Kong? Although Marks’ screenplay does a good job of underlining the humanistic parallels with the animal kingdom, the sincerity of his intentions is steamrolled by heavy-handed execution, perhaps most tangibly in the manipulative orchestral swellings of John Debney’s score. And on the subject of music, the inclusion of the best-known songs from the 1967 film not only seems perfunctory, but also jarringly incongruous within the realistic environment created to evoke the period and setting of the story. . These observations are, of course, likely to be immaterial to most of Disney’s target audience- perhaps rightly so. After all, whatever his socio-political philosophies may have been, Kipling wrote his Mowgli stories to entertain, and “The Jungle Book” certainly succeeds in doing justice to that purpose. Still, one can’t help but wonder how much richer it could have been made by a subtler hand, one that might have allowed for a bit of reflection on how to reconcile our modern sensibility with the more troubling issues contained in an iconic tale that, like it or not, is deeply ingrained into our cultural consciousness. Perhaps we will find out in two years, when Warner Brothers releases their take on it. Until then, this one will do well enough. Today’s cinema adventure: The Life Aquatic with Steve Zissou, Wes Anderson’s 2004 feature about a legendary oceanographer and his misadventurous quest for the giant “jaguar shark” that ate his partner. Featuring a full array of Anderson’s trademark elements- and a cast which includes several members of his usual company of actors- it met with a mixed and bewildered response from critics, which probably played a large part in its failure at the box office, but received praise for the performance of its star, Bill Murray, and managed to earn a number of award nominations despite the lukewarm reception. 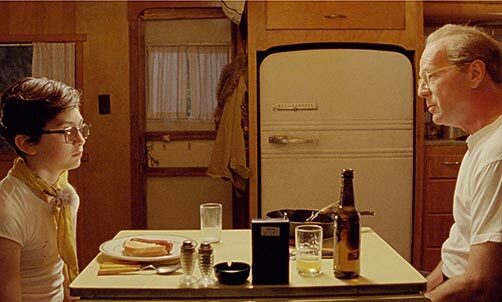 Though Anderson’s former writing partner, Owen Wilson, appears in a major role, this film marked the director’s first screenplay collaboration with fellow indie-filmmaker Noah Baumbach, a pairing which would later continue with the much more successful animated feature, Fantastic Mr. Fox. Drawing its obvious inspiration from the real-life career of famed marine adventurer and inventor Jacques Cousteau, the plot concerns itself with the personal and professional tribulations of the title character as he embarks upon a mission to exact revenge on the possibly non-existent fish that killed his long-time colleague. His long career, once marked by the popularity and success of the documentary films he produced of his exploits, has fallen into decline, while his personal life is in similar disarray with the onset of a mid-life crisis and the collapse of his marriage. When his expedition is joined by a young man who is possibly his son, rivalries are sparked among the crew and Zissou finds himself struggling with his own fear of emotional connection, as things become increasingly complicated by the presence of a pregnant reporter, an incursion of marauding pirates, and the interference of a rival oceanographer. As Team Zissou journeys the seas in search of their elusive quarry, their leader must work out his personal issues as he scrambles to prevent the failure of the mission, which may be his last chance to save his faltering reputation. True to Anderson’s form, the insular scenario provides a metaphoric framework for the emotional and psychological landscape of his characters, and as they negotiate the conflicts and obstacles of the plot, they are really working to resolve their own dysfunctional relationships with the world and themselves; and, as always, he draws on collective pop cultural memory to provide a distinctively quirky backdrop for his deadpan psychodrama. In this case, that backdrop is designed to specifically evoke the juvenile imagination of the late-mid-century generation he represents, a world resembling a sort of mash-up between The Undersea World of Jacques Cousteau and Jonny Quest; Zissou and his crew are not merely sea-going scientists and filmmakers, they serve as a sort of merry band of adventurers, facing intrigue and danger as they catalogue specimens, navigate unprotected waters, and weather the fickle opinions of the scientific community, film critics and their financial backers. The sea life they encounter on their voyage is as fanciful and implausible as the names of the exotic places to which they travel, emphasizing even more the deliberate ridiculousness of the premise, and giving the whole film the air of a made-up adventure game played in the back yard after a Saturday morning cartoon marathon. This pre-adolescent sensibility serves Anderson’s purpose in a two-fold way, suggesting thematic ideas that figure prominently in his tale. It allows him to offer up a tongue-in-cheek exploration of the gap between the brave promise of the nuclear age and its failure to reach fruition in the reality of modern adult life. Team Zissou’s adventurous voyage is a far cry from the optimistic visions portrayed in the treasured boyhood TV fantasies from which he has derived his inspiration; their highly-trained dolphin scouts are uncooperative and useless, they are saddled by their backers with a “bond company stooge,” and their space-age gadgetry has become broken-down equipment. Though it’s a running source of humor throughout the movie, this pageant of ironic de-mystification carries a decided tone of sadness and disillusionment that undercuts the comical posturing and lends an unexpected poignancy to the proceedings; and appropriately so, for it informs the other major theme of the movie. The Life Aquatic is a film about boys who won’t- or can’t- grow up, a phenomenon which seems to center on issues of fatherhood; Zissou’s ambivalent feelings towards his own father figure are merely hinted at, but his failure to resolve them are evident in his self-indulgent life of adventure, in which he continually pursues the elusive, whether it be a mythic sea monster or an unattainable woman, while he proudly and flagrantly disregards authority- but simultaneously seeks approval from the establishment it represents. His stunted emotional development is challenged by the arrival of another man-child, seeking his own validation from a father he never knew- a role Zissou is ill-prepared and unsuited for, but finds himself longing to fill. Through their shared journey on and under the sea- with all its richly symbolic implications- they undergo a shared rite of passage to manhood, and in their belated transition to maturity they find the potential to transform their world of compromised hope and sold-out ideals back into the enlightened future promised by the bright dreams of the past. Meanwhile, of course, the film’s few women wait, not always patiently, while the boys play at their adventure, hoping that the consequences of the game are not too dire, serving as mothers or lovers, or more accurately, both. 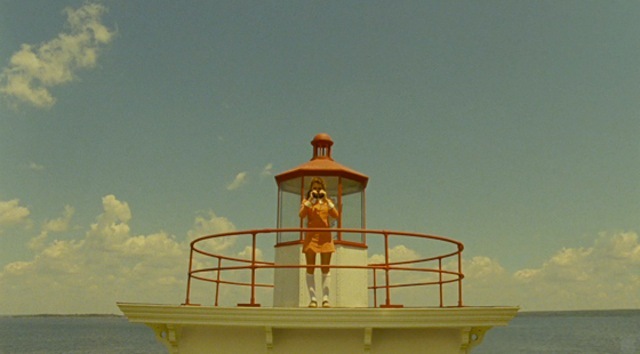 In presenting his male-centric delayed-coming-of-age tale, director Anderson utilizes all his now-familiar tricks of the trade: his meticulously tidy shot composition, his primary color palette (with an emphasis, this time, on yellow and blue), his visual influences drawn from a retro-hip nostalgic sensibility, his unapologetic use of obvious symbolism drawn from his own personal mythology, and, of course, his heavy use of vintage pop and folk music- here given a new twist by the inclusion of several Brazilian acoustic renditions of classic David Bowie tunes, most of them performed live onscreen by cast member Seu Jorge, adding to the film’s oddball blend of the exotic and the familiar. Another Anderson trademark, his affinity for montage and whimsical graphic illustration for setting up key points, is here given a particularly spectacular expression through the use of a life-sized cross-section set to represent Zissou’s boat (named the Belafonte in yet another nod to Cousteau, whose own ship was famously called Calypso); this enormous visual aid allows the director to indulge his obsession for the methodical establishment of his characters’ world and the arrangement of their thematic place in the story. For those scenes which take place off the boat, he chooses a variety of Mediterranean locations (beautifully captured by cinematographer Robert Yeoman) that evoke the flavor of the classic French and Italian cinema that has helped to shape his personal filmic style, but which also create a visual impression of old-time glamour and sophistication that- in many cases- has grown weathered and gone to seed. Anderson’s ensemble, for the most part, is made up of the actors he had in mind when he and Baumbach wrote the screenplay, a fortunate- and uncommon- occurrence which bears testimony to the director’s popularity with his cast and crew. 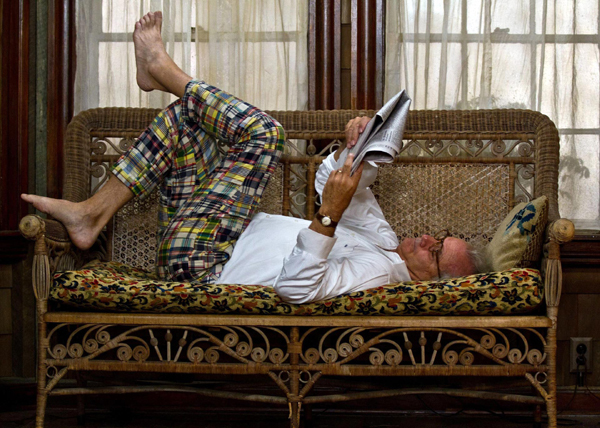 Most important, of course, is the central presence of the aforementioned Murray, whose dry demeanor embodies and defines the movie’s overall tone; always a surprisingly rich and subtle player, he uses his familiar screen persona to portray Zissou as a man who is good-natured, well-intentioned, and generous of spirit- but also infuriatingly self-absorbed and remote. These qualities are not static, however, and much of the joy that can be derived from The Life Aquatic comes from watching this perennially underappreciated actor navigate the complex changes undergone by the title character, embracing the demands of the moment with the refreshing gung-ho gusto that has always made him so likable, no matter how smarmy or pompous his role may require him to be. 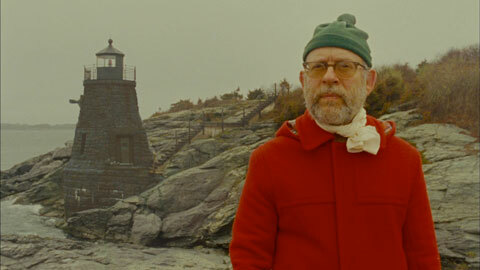 It’s a good thing for the movie that he has the ability to remain endearing, for Steve Zissou could easily have come across as a fatuous, manipulative phony; thanks to Murray’s self-deprecatingly buffoonish personality, we can see the charisma that underlies the character’s less pleasant qualities and believe that he is a man who inspires the loyalty and admiration of his misfit crew. As for the unlikely assortment of oddballs that comprise that crew- as well as the sundry other characters that populate The Life Aquatic– they are brought to varying degrees of life by a mix of familiar and not-so-familiar faces. 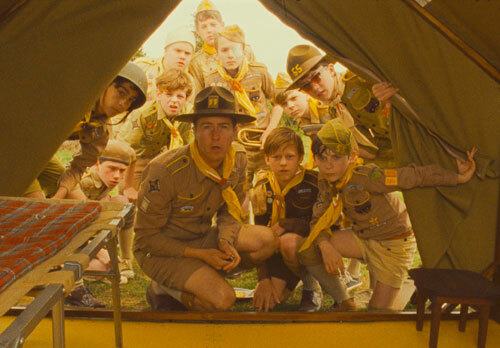 The most prominent is Wilson, who portrays the young newcomer who may or may not be Zissou’s son; with his earnest, gee-whiz manner and his genteel southern drawl, he provides both a contrast and a foil for the more flamboyant Murray, and suggests a child-like naïveté that reinforces the movie’s boyish-fantasy theme- though at times he comes off as too good to be true, or worse, seems simple-minded rather than simple. 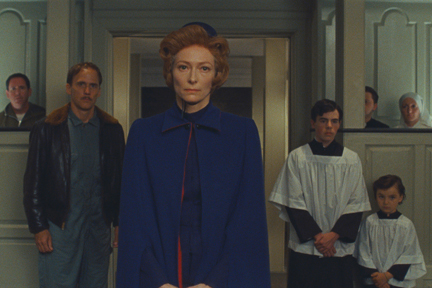 Anjelica Huston and Cate Blanchett, as Zissou’s estranged wife and the ambivalent journalist, respectively, are effective in their roles but are ultimately a bit wasted in the long run; Jeff Goldblum brings his usual oily eccentricity to the role of Zissou’s shamelessly self-congratulatory rival, Michael Gambon offers well-mannered class as a mask for the hidden shadiness of Zissou’s producer, and Bud Cort (of Harold and Maude, a film that clearly ranks high in the Wes Anderson pantheon of influences) gives a disarmingly human turn as the “bond company stooge.” As for Zissou’s crew members and interns, most of them are established as distinct “types” to flesh out the background, but unfortunately most of them remain there throughout the film without making much of an individual impression; the exceptions are the previously-mentioned Jorge, whose musical interludes are a frequent (and welcome) distraction, and Willem Dafoe, who plays Klaus, the German first mate whose petulant jealousy is aroused by the favoritism his beloved captain bestows on interloper Wilson. His emotionalism stands out from the rest of the crew, who seem nonplused and disaffected by even the most dramatic developments, but occasionally the performance feels a bit gimmicky, as if the actor were essaying a role in a comedy sketch instead of a major character in a serious feature film. This, in fact, sums up the most problematic element of The Life Aquatic; like all of Anderson’s work, many of the film’s situational conceits are pointedly absurd, and much of the dialogue is self-consciously glib, underplayed with a heightened detachment that gives the whole piece a somewhat artificial feel. Most of the time, it’s a technique that works, but there are times in the film when it gives the impression we are being put-on, creating a disingenuous air that threatens to undermine the sincerity of Anderson’s ultimate message. However, it is not the fault of Dafoe, or any of the other talented players, all of whom deliver on-the-money performances that are true to the style, that it sometimes feels like we are watching an elaborate and extended skit; rather, it is a sense that Anderson, in this particular outing, may have laid it on just a little too thick. 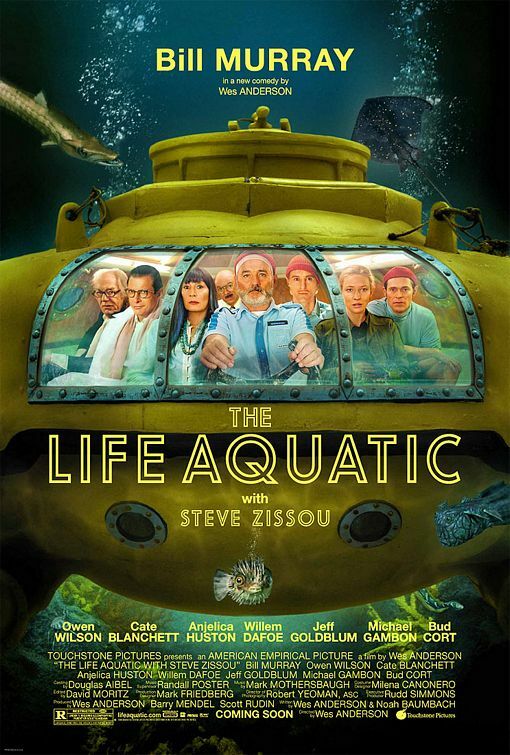 That said, however, I should be quick to point out that The Life Aquatic with Steve Zissou, though it may not be his best work, is a definitively Wes Anderson project, and as such, is full of more than enough delights to compensate for the occasional stylistic miscalculation. Indeed, it has become apparent over his relatively short career that this young filmmaker is a true auteur, a visionary director with an distinct and powerful style which can, perhaps, be easily imitated or parodied but never quite duplicated; his growing body of work exhibits a rare wealth of imagination, coupled with a desire to explore his own foibles onscreen- foibles he happens to share with most of his generation, and that find a unique form of expression through his cinematic voice. Coming at the mid-point of his career so far, and on the heels of his much-lauded The Royal Tennenbaums, The Life Aquatic with Steve Zissou perhaps represents a crystallization of his milieu, a vehicle with which he defined his personal style in the most assertive form to date. If it sometimes seems a little too much, maybe that’s appropriate; after all, Anderson’s films are not meant to be realism- they portray a world of archetypal dream mythology, re-invented with a hipster-ish vocabulary, perhaps, but no less profound for the twist. 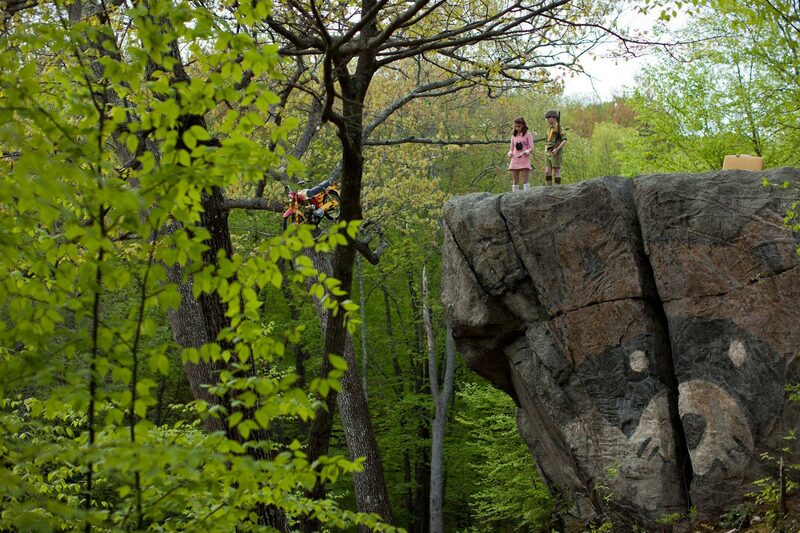 No matter that it sometimes feels like play-acting; indeed, in a film about boys who would rather go adventuring than grow up, that might even be the point. 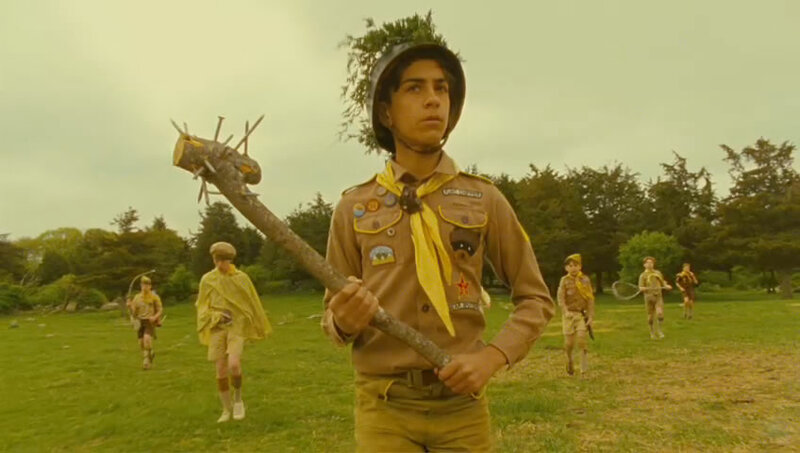 Today’s cinema adventure: Moonrise Kingdom, a 2012 feature that lets you know, from its very first frame, that it is the work of filmmaker Wes Anderson. The quirky, bittersweet tale of a pair of star-crossed 12-year-old misfits who enact a plan to run away together, it is a film that draws heavily on the entire repertoire of its indie-icon director; all the familiar elements are here, from the visual style of vivid colors and symmetrically-framed shots to the thematic elements of dysfunctional family structures and ritualized personal mythologies. Drawn in from the start by the methodical introduction of its characters (another Anderson trademark, here cleverly assisted by the use of Benjamin Britten’s “A Young Person’s Guide to the Orchestra” on the soundtrack), we are transported to a world at once fantastical and mundane, a nostalgic landscape of mid-century middle class life transplanted to a remote New England island setting; it is a place where the comfortable trappings of civilization exist in the midst of a verdant but unpredictable wilderness, a delicate balance reflected by its inhabitants’ constant struggle to contain the unfettered dreams of childhood by enforcing the rules of the adult world. Here, the local scouting organization seems to carry as much civic authority as the police force (which appears to be comprised of a single officer), a meteorological researcher takes on the role of mysterious, omniscient sage, and the larger social order is dictated by a tenuous connection with an outside world represented by various austere personages mostly present only at the other end of a telephone line. 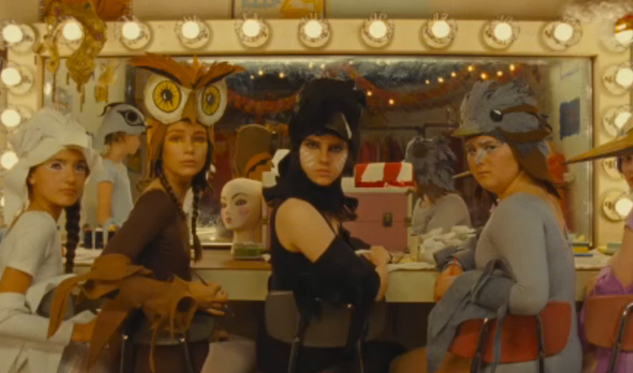 Within these oddball, darkly whimsical surroundings, Anderson unfolds a coming-of-age story, told from the perspective of the two children at its center, in which it becomes clear that the adult characters, for the most part, are the ones who must break through the barriers created by the frustration of their own youthful fantasies; the grown-ups are the ones who must “come-of-age,” and only then can the children- who think and behave in a highly adult fashion, or at least their attempted approximation of it- truly be allowed their childhood. This inversion of formula, in which the juvenile protagonists serve as catalysts for the transformation of their adult counterparts, is certainly nothing new: it has been explored in films ranging from early classics like Chaplin’s The Kid to contemporary blockbusters like Super 8; in particular, Anderson’s film seems to draw heavily on that mid-century classic of the genre, Disney’s The Parent Trap. 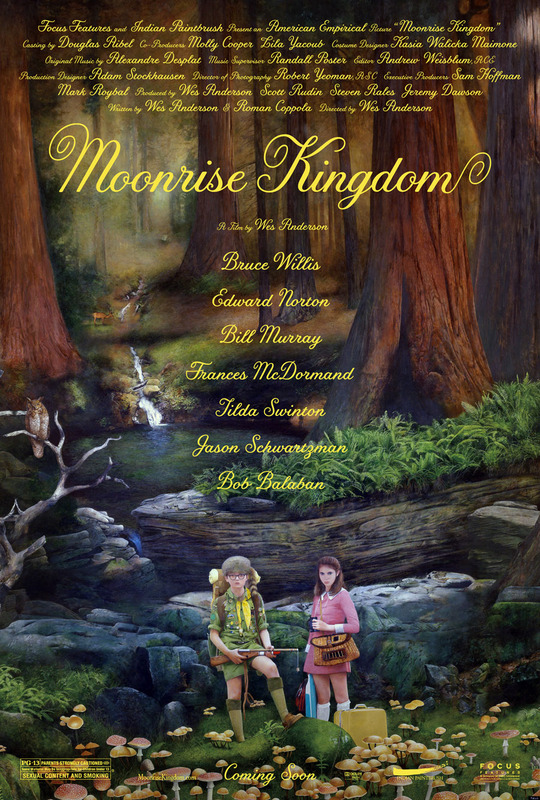 This, however, is in no way meant to imply that Moonrise Kingdom is derivative or full of clichés- on the contrary, thanks to Anderson’s characteristically disarming wit and pseudo-subversive charm, it is as fresh and surprising a moviegoing experience as one could hope. 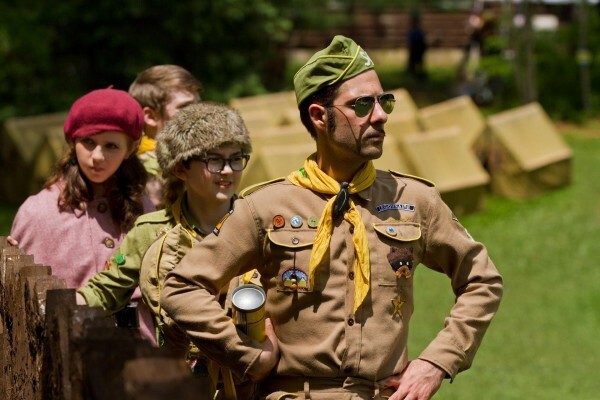 It’s probably the best Wes Anderson movie since The Royal Tennenbaums; and, of course, though the gifted director may take the lion’s share of credit for its success, it is a combination of elements provided by a worthy group of collaborators. To begin with, the screenplay, co-written with Anderson by Roman Coppola, is full of the kind of offbeat delights we have come to expect from this director: populated with characters simultaneously familiar and unique, comprised of inventive circumstances and conceits through which the story and its various sub-plots flow, and infused with a magical tone that nevertheless keeps ever-present the potential for serious real-life consequences; the proceedings never lose their underlying weight, but they are peppered with humor throughout, ranging from the dry to the morbid, and usually unexpected; and the abundant heavy-handed symbolism (place names like “Summer’s End,” a tree house impossibly positioned at the top of a very tall tree) is treated with such good-natured irony that it comes across as clever instead of just obvious. 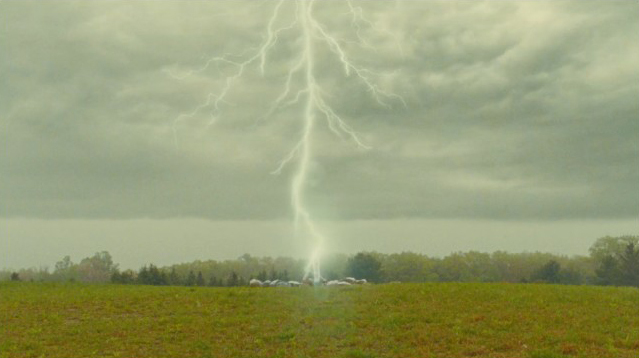 Anderson’s trademark visual style is captured with an almost-surreal crispness and color by cinematographer Robert D. Yeoman, and likewise contributing to the distinctive look of the film is remarkable work by Art Director Gerald Sullivan, Set Decorator Kris Moran, and Costume Designer Kasia Walicka-Maimone, who together create an eclectic style that resembles a collision of the catalogues from L.L. Bean and Eames Design Studio. As for the soundtrack, Anderson relies both on charming original music by Alexandre Desplat and, as always, a mix of obscure-but-familiar recordings- this time mostly eschewing his usual pop/rock choices for classical selections by Britten (the aforementioned piece as well as others) and Saint-Saëns, juxtaposed with the mournful crooning of Hank Williams. Of course, it is the ensemble cast that must ultimately bring Anderson’s cinematic symphony to life, and each member, without exception, is right on key. 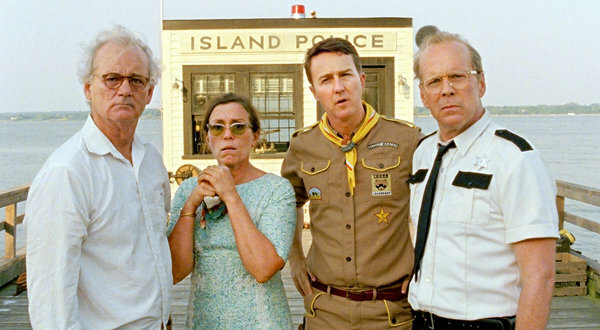 Edward Norton is tremendously likable as the plucky and earnest scoutmaster; Bruce Willis, as the local police captain, plays nicely against type while still taking advantage of his image as a tough man of action; Frances McDormand and Anderson perennial Bill Murray manage to capture the percolating bitterness of a long-embattled couple without making them unsympathetic; the ever-divine Tilda Swinton radiates a kind of institutional anti-Mary-Poppins vibe as a no-nonsense bureaucrat known simply as “Social Services;” Bob Balaban, Harvey Keitel and Jason Schwartzman (another Anderson stalwart) bring their own distinctive gifts to smaller roles; and an array of young actors contribute a spectrum of personalities as the scout troupe that gets caught up in the action. 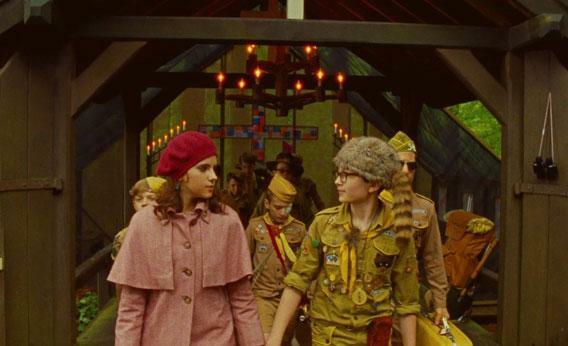 Despite this impressive collection of performances, however, the shining stars of Moonrise Kingdom are Kara Heyward and Jared Gilman, as the two pre-teen lovers around which the story revolves. Each underplay their characters with surprising skill and maturity, capturing the dispassionate detachment affected by these antisocial youngsters while still conveying the sweetness that lurks beneath it, and complementing each other’s work with a chemistry that is rarely seen in screen pairings between seasoned adult professionals; it’s their show, and it is a testament to their talent (and their director’s) that, despite being surrounded by a gallery of all-star heavyweights that includes two Oscar-winners and several other nominees, nobody even comes close to stealing it from them. 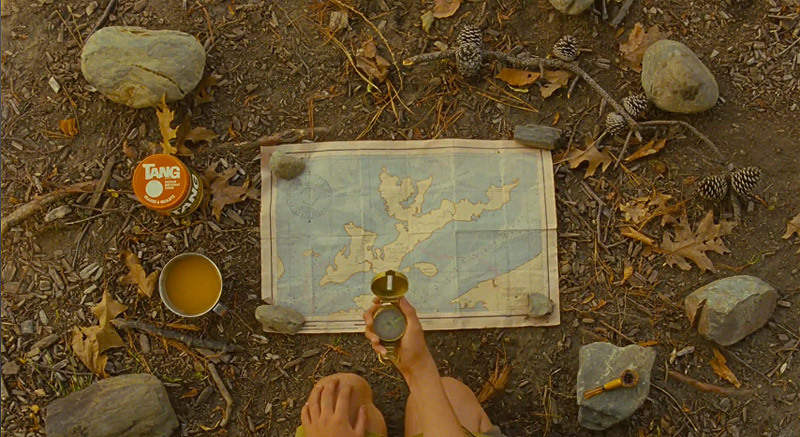 Moonrise Kingdom is one of those rare movie experiences that creeps up on you. After seeing it, I knew I liked it immediately, but it wasn’t until it had sunk in overnight that I realized just how much. There is a lot to take in: a plethora of details that Anderson meticulously arranges, just as his characters often arrange the contents of their suitcases or the objects on their desk; and just as those everyday items are transformed into talismans and icons by their owners, so too are all the pieces of Anderson’s movie invested with a significance that gives them a subliminal, cumulative effect when woven together into the whole. 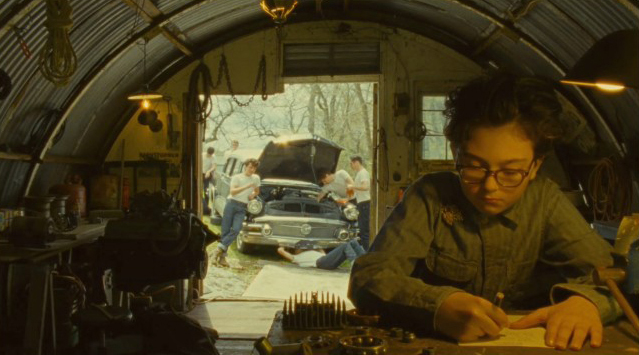 By the end of Moonrise Kingdom, you find that you’ve been moved on a level so deep, it doesn’t even have a name, and you didn’t even know it was happening. It’s a feeling that makes all the delights of the previous 90 minutes seem even more rewarding. Sadly, in a season full of mysterious alien beings and comic book action heroes, this little film is likely to be overlooked by a majority of moviegoers. 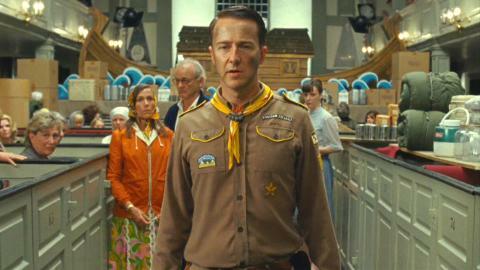 Don’t be one of them: go and see Moonrise Kingdom as soon as possible; it will likely be only the first of many times.